The Sony Project Morpheus virtual reality headset was unveiled for PS4 earlier this week at the GDC gaming developer expo in San Francisco. Still just a prototype and not available to buy till at least next year, the new platform's emergence still pits it, in many gamers' minds, against the new, PC-fuelled Oculus Rift 2 dev kit that was also revealed this week. Having tried out every iteration of Oculus Rift VR gear to date, we were keen to see how the PlayStation prototype stacked up against the virtual-world competition. So we snuck behind Sony's booth on the show floor and procured a headset to test for a good hour - then fought off anyone who tried to take it from us. 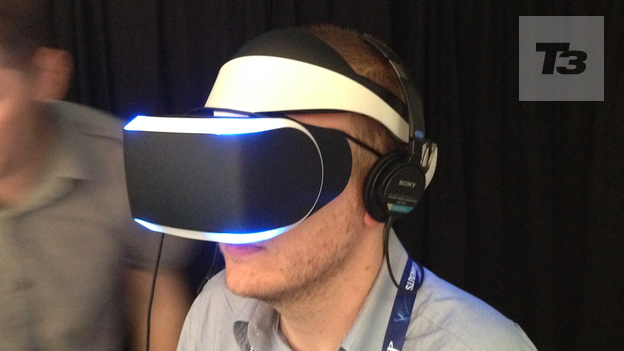 Article continues after our Sony Project Morpheus hands-on video. The first thing you notice is how polished the device is, even at prototype stage. If the Rift DK2 is an improvement on the original but still fairly rugged, blocky and industrial, Sony's is a proper sci-fi headset. Talk of previous iterations being held together with duct tape are banished, its sleek white plastic and blue Move-derived light sensors that flank the front and dot the rear are instantly recognisable as PlayStation, the front-on view such a Lawnmower Man-esque, Daft Punk-like future vision it's almost funny. This is big, bold and hard to ignore. The complex headset has multiple methods of adjustment, too, a material strap that holds it loosely in place, much like the Rift, bolstered by a best-fit mechanism that's activated with a switch within a solid plastic band around the back of your head. This extends out and in with a tug; once roughly right, a click dial then gradually tightens or loosens the headset depending on taste and helps achieve the sweet spot of VR, much like 3D. It's important to get this right, too, or else its all a bit of a blur. There's another switch on the front base that allows the whole top portion to shift out, too, allowing fans of glasses to be able to have it sat slightly further back for increased comfort. There's a clear focus on helping people into the fold at all turns. Unlike the Sony HMZ personal viewer series, which can pull the head down at the front with excessive wear and tire the neck, the weight here is well distributed, the solid plastic band that circles the head balancing it well. Most importantly, it's comfortable, with extensive cushioning all around and no noticeable pressure on the head - in fact, you can easily forget you're wearing it when in the middle of action. Yet, as Sony is at pains to point out, this is not a consumer device yet and its prototype nature is demonstrated by its occasionally faffy nature. We were first assisted putting it on, amid the multiple straps, dev-kit connected wire (a proprietary one, receiving images and tracking data) and separate headphones (your own and not part of the headset, although this handily means wireless cans can and will be used in the long run). But just as we thought every virtual reality tourist now needed a VR spotter to boot, on our third go everything clicked into place. This is a product, like any other, that you warm to the more you play with it, and it all feels decidedly new, even if you're familiar with Oculus's well-made wares. Despite Morpheus being well ventilated and airy, your head still gets a bit sweaty during play, the demo kit being wiped down with a towel between trials out of necessity as much as courtesy. But that could similarly be a recommendation, the pure rush of a ten-minute blast of Eve Valkyrie VR something that's hard to communicate aside from 'Top of the leaderboard!' (a feat that lasted mere minutes, we should add; the device isnt the only thing that's new). And so we come to the actual experience, and while we're long-term VR converts, the Morpheus is a noticeable step up from what's come before in terms of overall quality. It reeks of cherry-picking the best tech from multiple divisions, which is exactly what Sony has done. Packing gyroscopes to register head movement effectively, not to mention a 1080p display at a 90-degree field of view, Morpheus also squeezes in six points of motion tracking, with two either side of the face and a further two on the back strap. The visuals are clear, the positional monitoring is spot on consistently and we experienced no 'out of vision' pop-up warnings like you occasionally get on Rift dev kits, which jar you out of your artificial existence. The focus on comfort, with copious cushioning and a demonstrator obsession with not having the headset pushed too close to your face, does create a slight recess, a mini tunnel effect that can make it look like you're peering into the action through a pair of binoculars with the magnification turned off. But for most of the time you have Morpheus on, you are literally in another world. Of the three extended demos we enjoyed, Eve Valkyrie was the most typically gamey one. It's fairly unsurprising that the finest slice of VR to hit Oculus Rift has made the swift port over from PC, and the space shooter assigns lock-on missiles to the DualShock 4's left trigger, guns to the right and nitro to the X button to good effect. The ability to focus on multiple targets around your vision and the sheer scale of multiple dogfighters duelling around huge spaceships is a proper Star Wars moment, the positional trackers on the rear of Morpheus meaning you can look all around you and it never loses your place in the world, the PS4 Camera watching on and taking it all in. Running 1080p at 60Hz is fairly impressive, though there is still a little motion blur due to the sheer 'Quick! Look around you! Now!' nature of many of the demos, with developers already thinking of fixes; SingStar creator London Studios utilises clever graphical shortcuts to overcome it in their underwater exploration The Deep, for one. The worst to suffer is The Castle, a cheery medieval crossbow and sword fest that occasionally struggles to keep up with your eye movement. It's not to the overall detriment of its world, though, as the sense of 3D depth judged well as you hack off knight's arms with relish and take pot shots at targets. There are a selection of more serene demos, such as the walking on Mars experience developed with NASA, but it's the aforementioned The Deep that made the biggest splash, stunning us into first gibbering fear then a staggered silence. A short, theme park ride-esque trip to the ocean depths in a shark cage that slowly goes awry, a lone flare gun for company, we had gradual heart palpitations as our decidedly Jaws-y fate dawned on us, your finned aggressor circling you as Morpheus's front and rear positional trackers allow you to literally turn in ever-increasing circles. We'd often thought about going on a diving holiday; Sony just saved us the expense/feeling of impending doom. We're told there's a second-screen tablet game for another player to accompany your journey to The Deep, where you can throw turtles into the shark's path from a top-down view to lure it towards your underwater friend/foe - though it wasn't playable - and the attempts to make what could be a very solitary medium more social is palpable. Sony Worldwide Studios boss Shuhei Yoshida referenced Nintendo's Wii U GamePad and its idea for "asymmetric gameplay" ideas. He alsotalked to us about Morpheus's "social screen", which broadcasts what you're seeing on to your telly one-to-one with clarity - rather than in the unwatchable circular split-screen raw output - for others to laugh at or interact with. It's also fascinating to see what Sony R&D's Richard Marks said at Tuesday's keynote play out in real time: your real-world setup directly affects your levels of immersion. With Eve Valkyrie, the demo is seated, as in the game you are reclining in a spacecraft's cockpit (previous demos have used DriveClub, interestingly); with The Deep, you are made to stand up, and in the computer-generated world you are upright in the cage. This is not a coincidence. To reverse these environments would have negative effects on your immersion, taking away the feeling of "being there". Likewise, you control the flare gun in The Deep with a DualShock 4, but rather than the analogue sticks, you use the motion sensors and literally move it around, firing with the trigger. Yet if this supported Move's gun attachment, it would be even better, as the more you can match the specifics of the content, the more you get carried away. So, peripheral makers at the ready - we really can't wait for the sky-diving demo that requires you to be prone, suspended from the ceiling from braces like a human mobile. The Morpheus isn't a standalone unit, anyway, with the understated and often missed PU box (processing unit) handling imagery and audio transfer externally, which is what keeps the weight so light (in the Rift, it's all in the headset). The four wires in the back are an AC adaptor, two HDMIs - one feeding in from the PS4, the other leading out into your telly - and a USB also connected to the console. The proprietary cable coming out of the front sends the tracking info between headset and PS4, while also adding 3D audio into the equation. Yoshida confirmed to us that the processing box will evolve as well as at the headset itself, as much a part of Morpheus as its more limelight-hogging partner. While Oculus pioneered this new form of gaming publicly, the emerging VR platform - which all involved very much declare virtual reality to be - needs a big name to take it to the masses, and PlayStation is very much that. Even the team at Oculus acknowledges that such a large, multinational player entering the market will validate their own endeavours, and Sony's perfect storm of technology and hefty investment raises the bar considerably. What's also clear is that gaming is just the tip of the iceberg here - this is actually an experiential portal with a multitude of uses, from educational initiatives, commerce interactivity and even virtual tourism. Indeed, Yoshida told us that what he's most excited about is not playing games, but visiting places he's never been. Likewise, just as we were petrified of the diving simulation, could you wean yourself off personal fears by facing them in a safe environment, like that Oculus Rift guy freaking out on the rollercoaster on YouTube? With whispers of PlayStation attempting to get the price in a similar ball park of its umbilical PS4 console, and with Yoshida dismissing to us any notion of this being a consumer product this year, you could be forgiven for thinking this was currently just a niche plaything to get developers excited. Yet the design is already so strong, the experience so revelatory at times and the potential for life-changing applications away from gaming so clear that we wouldn't bet against this coming to market sooner than expected. Besides, everyone looks a bit like RoboCop when they're wearing one, too; we'd certainly buy that for a dollar, what about you?